On Monday September 24, the SAP Community Call held a session about reputation in SAP Community. Chris Kernaghan was the host, and I presented and moderated in the session. I don’t intend to do a recap—Tammy Powlas already covered that with her post SAP Community Reputation Call Webcast Recap (thanks Tammy!). I want to encourage those who were unable to attend the live session to check out the recording and the presentation slides. There were a few questions that we did not wind up having time for in the panel discussion (I think all of us would have loved to spend another hour talking about this topic!). 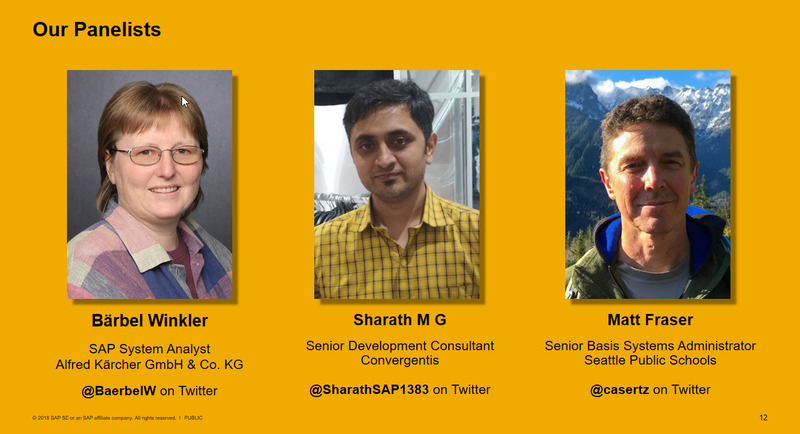 We had three very interesting members on the panel, all of whom have been Member of the Month in SAP Community at some point in the past: Bärbel Winkler, Sharath M G, and Matt Fraser. Two of the panelists have graciously agreed to provide their answers to the additional questions in writing to me, and I’ve published them below (Matt is still on travel in Peru or I’m sure he would have chimed in too). I encourage you to listen to the recording, read the panelists’ additional answers, and then post any questions you may have for the panelists on the topic of reputation in SAP Community in the comments on this blog post. They all said they will be happy to answer. Q: Can you tell us about another member you hold in high esteem, and can you detail for us why? A: Jelena Perfiljeva – she doesn’t hold back her opinions and states them in a clear and concise way. Q: When you are consuming content by other members of the community whose names are not familiar to you, how do you evaluate their reputation? What do you look for in another member’s presence that indicates to you whether you may find value in their content? A: I sometimes check their profiles to see how much and how they have already contributed. If there are already responses to a question or comments to a blog post by other well-known community members it is also an indication that the content might be of value. Q: As Members of the Month, all of you serve as role models for new members. How do you generally engage with new members, who may need some help or guidance to get established and build their reputation? A: This is perhaps something I should/could do more. But it’s often difficult to know who actually is a “newbie” in need and appreciative of some encouragement and who may just balk at getting unsolicited advice. A: Jeremy Good and Elizabeth Gutt, for giving me chance to be part of SAP Jam group and opportunity to present my content to the global team. Q: When you are consuming content by other members of the community whose names are not familiar to you, how do you evaluate their reputation? What do you look for in another member’s presence that indicates to you whether you should bother to consume their content? A: Generally, the profile with their followers gives a clue in terms of their reputation. But, I try hard to form opinions and try to consume the content as it is. A: Share my experiences, guide them in questions and answers. Hopefully, inspire and encourage them to express their views. I want to thank the panelists again for their informative and gracious participation in our panel discussion. Do you have a question for one of the panelists? Feel free to ask it in the comments below. Thank you Marilyn Pratt. It was an opportunity to share some of our experiences especially over the many years of association with SCN. In fact, its nothing compared to the benefits I have drawn from the community during all these years. I agree completely; for me personally it was far more enriching to share the stage with Bärbel Winkler and Sharath M G and hear their stories and perspectives, and I was honored to be invited to do so. I’m hoping to meet them both in person sometime soon. Shall we all say TechEd 2020 in Bangalore? To add to “how do you generally engage with new members” answer, Bärbel has posted a blog not long ago that any new members would be wise to read. Sharath M G – I am humbled by your mention about our collaboration Jam group, but it serves as a special reminder that community and collaboration should always be one and the same. In spite of different employers, different member status of customer, partner, SAP employee, etc. we all share the same passions for SAP related technologies, solutions, and products. Thanks again, Audrey, and Chris Kernaghan for hosting, and Bärbel Winkler and Sharath M G for participating. It was a delight and an honor. I apologize for not being available for the follow-up, but I am home as of today from my travels, and ready to dive in.